Tue., Nov. 8, 2016, 6:08 p.m. The Gus Bus might be first to hit the road. 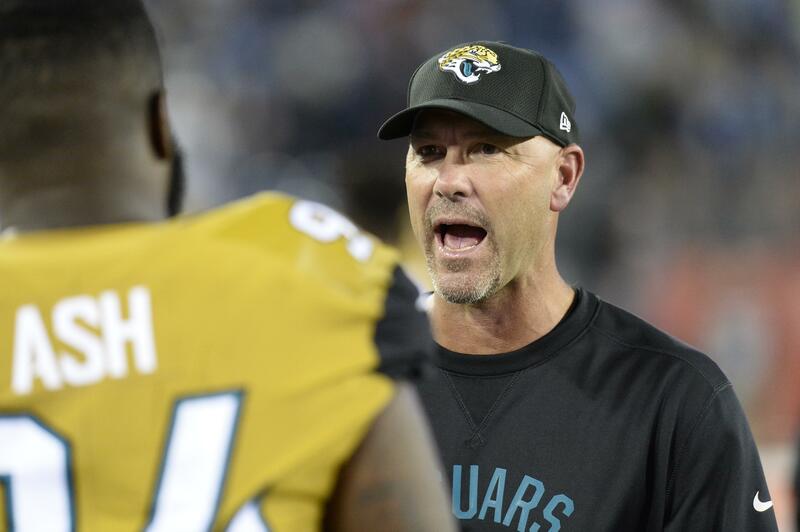 This was supposed to be the year Gus Bradley turned the Jacksonville Jaguars into a contender. After going 12-36 in his first three seasons, Bradley got a one-year contract extension through 2017. That came with heightened expectations. After all, the Jaguars spent more than $350 million (nearly $150 million guaranteed) in free agency the last two years to sign 10 starters. They assembled a roster of talented young players. All signs pointed toward a major step forward. Instead, the Jaguars are 2-6 and headed nowhere in the weak AFC South. There have been at least six coaching changes in the NFL in each of the past six offseasons. Bradley could be the first to go this season, and there’s no guarantee he makes it through the second half. Rex Ryan: The Bills haven’t made the playoffs since 1999, the longest drought in the NFL. Ryan vowed to end that streak when he took over last season. He failed in his first try, going 8-8. Ryan fired offensive coordinator Greg Roman after a 0-2 start this season, but he could be in trouble if Buffalo (4-5) has a losing season. Chip Kelly: The 49ers have lost seven in a row since opening the season with a shutout win over the Rams. Kelly has three years left on his contract and the 49ers fired Jim Tomsula one season into a four-year deal after 2015, so it’s unlikely they would do it again. But if Kelly wants to return to college football, he’ll get a comfortable push out the door. Jeff Fisher: The Rams had four straight losing seasons under Fisher in St. Louis and they’re headed toward another one in their first season back in Los Angeles. If the Rams (3-6) don’t turn things around in the second half, Fisher may not stick around to see the Jared Goff era. Mike McCarthy: The Packers have reached the playoffs eight times in McCarthy’s 10 seasons and seven years in a row. But they’ve had disappointing playoff losses since winning the 2011 Super Bowl and are 4-4 this season. Unless Aaron Rodgers gets them back on track, McCarthy’s time in Green Bay could be up. Chuck Pagano: The Colts (4-5) beat the Packers on the road to get back in the race in the AFC South. Pagano led the Colts to three straight 11-win seasons, but he was in trouble last year after going 8-8 with Andrew Luck missing a chunk of games. He signed a four-year contract extension in January, so that gives him some security. But Pagano may have to win a playoff game to stick around in Indianapolis. Marvin Lewis: The Bengals have reached the playoffs seven times in 13 seasons under Lewis, including the last five years. They’re 0-7 in those games. At 3-4-1, Cincinnati’s postseason run is in jeopardy. That could lead to the first coaching change since 2003. John Fox: The Bears are 2-6 after going 6-10 in Fox’s first season. Fox led the Panthers and Broncos to big jumps in his second year, but that’s not happening in Chicago. He might not get a third season. Jim Caldwell: The Lions are 5-4 after rallying for an impressive win at Minnesota. They won 11 games and reached the playoffs in Caldwell’s first season, but they started 1-7 in 2015 and needed a 6-2 finish to preserve his job. A collapse down the stretch could lead to Caldwell’s departure. Todd Bowles: The Jets are 3-6 and reeling, a season after going 10-6 and narrowly missing the playoffs. Bowles could be gone if they continue to spiral downward. Mike McCoy: The Chargers tumbled to 4-12 last year after going to the playoffs in each of McCoy’s first two seasons. Now they’re 4-5 and another losing season could cost McCoy his job. Fresh off their bye week, the New England Patriots returned to the practice field and players said they took advantage of the time off to get their bodies ready for the second half of the season. The Patriots, 7-1 after reeling off four wins with Tom Brady back following his “Deflategate” suspension, open their second half at home Sunday night against the Seattle Seahawks. With some of their bumps and bruises healed. This is a healthy team that will have back running back Dion Lewis either this week or Nov. 20 at San Francisco. Wide receiver Chris Hogan was excited about returning to work. The team traded Pro Bowl linebacker Jamie Collins to Cleveland at the start of the break. To cap off their week, the Patriots got to watch their next opponent play Monday Night Football, giving them a look at two mobile quarterbacks, Tyrod Taylor, whom they just faced in Buffalo, and Seattle’s Russell Wilson, who nearly beat them in the Super Bowl two years ago. “It’s difficult any time you have a guy that’s mobile that can make every throw on the field, is very accurate, is a very good quarterback in the pocket and yet when things aren’t looking so good he can pull the ball down and try to run for a first down,” Ninkovich said. The Minnesota Vikings held off on switching kickers for now, with the struggling Blair Walsh still in place. After holding tryouts for several free agents, the Vikings didn’t put any signings on the league’s transaction log. NFL Network reported the Vikings will keep Walsh after working out six kickers including Randy Bullock and Kai Forbath. Walsh missed an extra point and had a field goal blocked on Sunday, when the Vikings lost in overtime to Detroit. They play at Washington this weekend. Published: Nov. 8, 2016, 6:08 p.m.